Lifelong Education: A Psychological Analysis presents an analysis of some of the major theoretical assumptions of lifelong education within the context of its psychological basis. Some of the main features of school curriculum are also examined from the point of view of lifelong education. Comprised of eight chapters, this volume begins with an overview of modern education and its role in addressing the challenge of change, as well as lifelong education's psychological assumptions the implications of psychology for a lifelong education-oriented system. 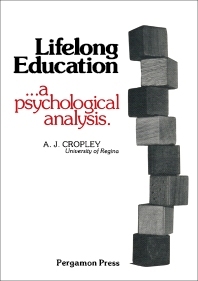 The discussion then turns to the arguments that have been put forward to support the concept of lifelong education; how psychological knowledge can, and indeed should, be applied to the analysis of lifelong education in order to test whether the principle has any legitimacy; and psychological functioning throughout life. The role of intelligence and cognitive functioning in lifelong education are also considered, along with the concept of socio-affective development and how schooling might be modified in order to enable it to serve the goals of lifelong education. The book concludes with a critical evaluation of lifelong education, with emphasis on the psychological issues. This monograph is intended for educational psychologists, scholars, instructors, and students. Bruner and the Building of One's Own "Reality"
Can School Develop Lifelong Learners? Implications of Lifelong Education for "Curriculum"
Lifelong Education and "The Establishment"